Like many, my husband and I have embarked on a mission of Gratitude. Each day, we take time to acknowledge and appreciate those aspects of our lives for which we are grateful. We try to do this first thing in the morning and as we wrap up our evening. Yesterday, after we put up our Christmas tree, we realized it is a monument to those things in our lives for which we are grateful. We’ve collected ornaments for the thirty five years we’ve been married. Our tree tells the story of the joys of our lives. We have family ornaments and ornaments that were gifts from loved ones. Over the years, we’ve collected them from the places we’ve journeyed. Our daughter brings us ornaments as a gift from her travels. The very first was from a trip with her high school softball team. Others have been from adventures with friends and studying abroad. Often, I would convert gifts from my children into ornaments. 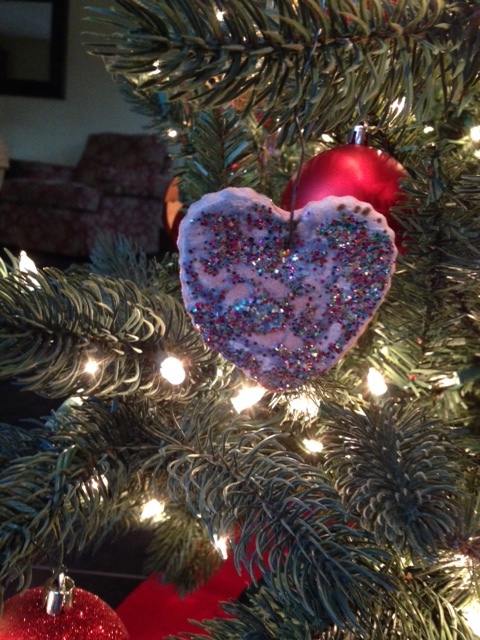 This lovely glitter covered, clay heart was a Mother’s Day gift from a two year old. It was originally the charm on a necklace made of string. I think it makes a much nicer decoration for the tree than a fashion accessory. 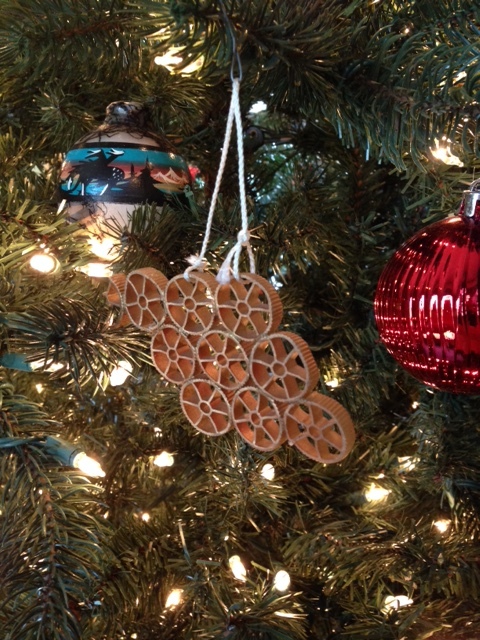 When my son was five, he and his class made ornaments out of macaroni. Most of the children made stars and Christmas trees. My son made a tank, patently inconsistent with the holiday spirit! For the first few years, I hung the macaroni tank out of a sense of obligation, but usually somewhere near the back. Eventually, the tank grew on me and came to be hung is a place of honor. It was a perfect expression of the five year old son who was quickly growing up. The first year my son was in college, our Christmas tree fell in the middle of the night. We didn’t hear it fall, but found the mess the next morning. As we cleaned up, we marveled at how few ornaments we lost. There were some we could repair and only two that were beyond repair. Sadly, one was the macaroni tank I’d grown to love. A few days later, my son called my husband looking for gift ideas for me. My husband told him of our tree mishap and suggested he might make a new tank for me. I cried when I opened it! Now, the new tank has seen better days. A little piece has broken off the front and we handle it with care. It has lasted longer than the original, but I can see that its days are numbered. I’m not sure what the shelf life is for macaroni ornaments, but I think mine is nearing its demise. Each year, I fear I will find a pile of gold macaroni dust in the ornament box. This entry was posted in Family, Holiday, Home, Memoir, Memories, Personal History, Stories, Traditions. Bookmark the permalink.